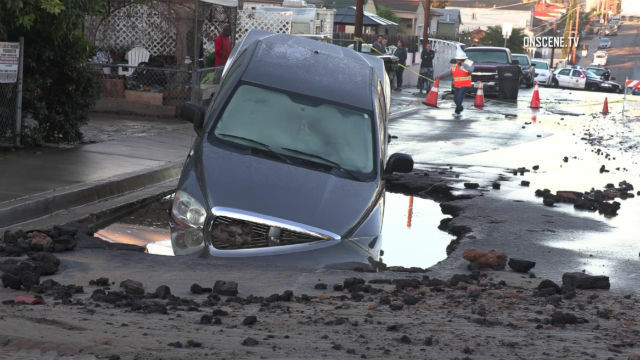 A water line broke Wednesday morning in a hilly neighborhood on the border of San Diego and National City, flooding several nearby homes and opening a large sinkhole that partially swallowed a pickup truck. The pipe ruptured in the 4500 block of Delta Street, just west of Interstate 805, where San Diego’s Mountain View neighborhood meets National City. Delta Street was still closed around 7 a.m., roughly an hour after the water line first broke. A pickup truck was partially swallowed by the sinkhole, footage from several news crews showed. The hood of the truck was under what looked like several feet of water, with the bed jutting out. The break happened near the top of a hill and flooded several nearby homes. Just after 7 a.m., city crews appeared to have stopped the flow of water from the broken line.